By June 12, 1864 the Confederates stopped the Union forces outside of Petersburg, Virginia. The Union ceased assaulting Petersburg and switched to a siege. In an attempt to break into Petersburg, IXth Corps Union troops with coal mining experience dug a tunnel to place a mine under Confederate fortifications just east of Petersburg. One hundred fifty years ago on July 30, 1864 the mine was exploded and Union troops assaulted Confederate positions. Among them was our Civil War ancestor Anson Croman in the 20th Michigan Infantry Regiment. 20th Michigan’s position (ORANGE CIRCLE) and direction of the attack to the west of the crater from the mine explosion. Contemporary drawing of the Union assault on The Crater. The 20th Michigan is to the left out of this picture. The Confederates held and quickly closed the gap created by the explosion and assault. The 20th Michigan lost 5 killed, 26 wounded, 16 captured, and 2 missing. During the Battle of the Crater when African-American Union troops attempted to surrender, the Confederates summarily executed some on the field. The Confederates considered African-American Union troops to be racially inferior escaped slaves engaged in a slave insurrection and therefore not entitled to be treated as prisoners of war. Those who were not executed would be sold into slavery. The Confederates also threatened to try and execute any captured European-American officers who commanded African-American troops. The Confederates claimed those officers were inciting slave rebellion. The Confederates decided not to proceed with trials when the Union threaten retaliation against Southern POW officers. Anson Croman served in the 20th Michigan Infantry Regiment from his 1862 enlistment until the Confederate surrender at Appomattox, Virginia in 1865. Among the articles in the August, 2014 issue of America in WWII is a one about the American WWII Orphans Network (AWON). Among the families discussed is is our friend and neighbor Phyllis Noble’s. For every combat pilot, as many as twelve men and women were providing support such as Phyllis’s father Russell. In 1943 he was a victim of a booby trap left behind by the retreating Nazis in Libya near Benghazi. He is buried in the North African American Military Cemetary in Carthage, Tunisia. Currently the article is only available in the print edition. America in WWII publishes many of its articles on their web site at a later date. 70 years ago on July 25, 1944 Company C, 3110th Signal Service Battalion landed on Utah Beach. Among them was Private Felix A. Cizewski, my late father. The monument to the landing of the 2nd French Armored Division six days later on August 1, 1944 marks the spot where Company C landed. June 1, 2014: Leonard H Cizewski at the northern end of Utah Beach at the monument where the 2nd French Armor Division landed on August 1, 1944. My late father in Company C, 3110th Signal Service Battalion, landed near this site six days earlier on July 25. From Utah Beach Company C proceed to Transit Area B at Focarville then to Tamerville. 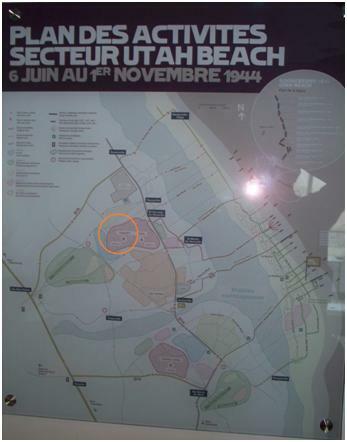 A map (below) at Le Musée d’Utah Beach detailed how Utah Beach was used for troop deployment such as Company C.
Plan of Activities at Utah Beach, June 6 to November 4, 1944. Orange circle: Transit Area B in Focarville from where Co. C proceeded to Tamerville. Company C landed on Utah Beach on July 26, the first day of the Northern France Campaign and one day after the official end of the Normandy Campaign on July 25. The U.S. Army defined the geographic area of the Normandy Campaign as including the waters of the English Channel. Geographic area of the Normandy Campaign. On July 25, Company C boarded ships in Southampton, England, leaving the soil of England, entering the geographic region of the Normandy Campaign, and earning Normandy Campaign Participation Credit. Company C was activated in December, 1943 with about 50 enlisted men and 4 officers. When Company C landed on Utah Beach it had had 223 enlisted men and 13 officers. Those additional troops most likely were detached from other Signal Service units and attached to Company C for the work in Tamerville and Valognes. I will add to my ongoing research those attached units. Northern France: Includes details of the 3110th Signal Service Battalion’s service in Normandy. My late father Felix A. Cizewski served in Company C, 3110th Signal Service Battalion in Tamerville and Cherbourg during the liberation of Normandy in 1944. Wilbert Hans Hansen with Technician Fifth Grade insignia. Wilbert Hansen’s son Chris Hansen found the information I have been posting about the 3110th Signal Service Battalion and the Tamerville recognition. Chris’s late father Wilbert Hans Hansen served as a cable splicer in Company C, 3110th Signal Service Battalion as did Felix A. Cizewski my late father. Our fathers probably knew each other. Chris reports that except for the photo above almost everything else regarding his late father’s service has been lost. Northern France with details of the 3110th Signal Service Battalion’s service in Normandy. The Tamerville “Tribute to Our Liberators” sign has been permanently installed on the west wall of the cemetery next to the town hall. Tamerville’s “Tribute To Our Liberators”sign on the west wall of the cemetery next to the town hall. My late father Felix A. Cizewski, served in Company C, 3110th Signal Service Battalion in Tamerville and Cherbourg during the liberation of Normandy in 1944. Genetic cousins Leonard Cizewski (left) and Daniel Ewenczyk. Leonard and Daniel share a paternal ancestor from about 17 generations ago. We estimate that to be from about 1590, about 425 years ago. While in Paris we had lunch with Leonard’s genetic cousin Daniel Ewenczyk. As part of our family history research both of us submitted DNA samples to databases. When Daniel confirmed a DNA connection, he contacted Leonard. 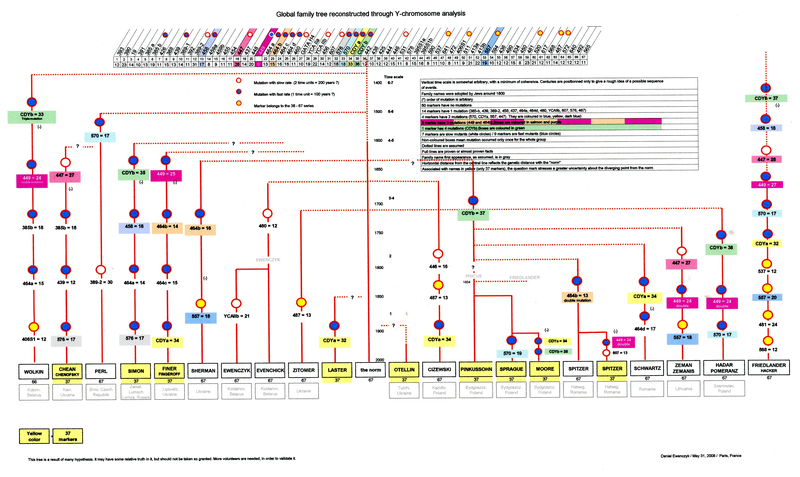 We estimate that we may be about 10th degree cousins from a common paternal ancestor from about 350 years ago. Despite our DNA distance, Daniel and I have have become friends and family. Our DNA confirmed Cizewski family oral history that our ancestry both Slavic and Jewish. When the Cizewski ancestors lived in Poland, the population was about 10% Jewish. The parts of Poland from which my family came were 25 to 50% Jewish. Daniel’s graph of our DNA relationship. Click for a larger image. The Cizewski Family is second to the right of center.The Ewenczyk family is to the left of the center. During our trip to Normandy, we visited both an American and German military cemetery. stones and a yahrzeit candle. Approximately 11,000 American are buried Colleville-sur-Mer. Some died during the D-Day landings but the majority died during the subsequent campaigns to liberate France. All are in individual graves in a 172 acre highly visible centrally located cemetery overlooking Omaha Beach. Decorations are regularly placed by both family members and the local community. In contrast the main German cemetery for about 12,000 soldiers is on about 17 acres, about 1/10th the size of the American cemetery. The cemetery is off the main roads in the far southwest corner of Normandy on the border of Brittany. Instead of individual graves the bones of six soldiers are together in a vault in an above ground crypt. The soldiers are from the 1940 invasion of France, the 1944 Normandy Campaign and liberation of France, and prisoners of war who died between the end of the war in 1945 and 1949 when all remaining German POWs in France were returned to Germany. The minimalism of the German cemetery may be a statement about the unprovoked aggressive war of conquest and genocide in which these German soldiers died.